When it comes to fashion and clothes and accessories, I’m a pretty minimal / basic kind of girl. Find me the perfect fitted tee and I’ll buy it in every color. In terms of jewelry I wear special, meaningful pieces. Often they’re gifts from Bryan or sometimes more pricey pieces that I’ve had forever and wear over and over again. I don’t wear statement pieces a lot – unless its a gorgeous necklace with a simple black dress for a night out. I LOVE this new necklace from Erin McDermott Jewelry. Not only is each of her pieces handmade, each piece has a special story and was carefully created by Erin with so much love. 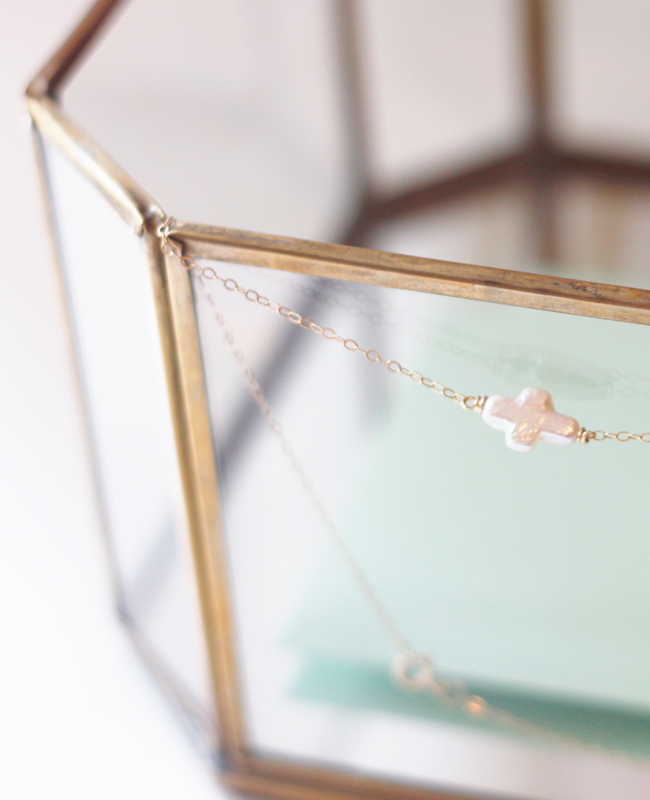 For a long time I wore this cross necklace from Stella & Dot. (Like… I never took it off). Now, I’m wearing this version of the laid-down cross from Erin. It’s a freshwater pearl necklace. It’s just gorgeous and feels so special. I haven’t taken it off in weeks. You may recognize Erin’s pieces from Garden & Gun, Martha Stewart Weddings and Real Simple Magazine. All of Erin’s jewelry is just gorgeous and she’s been so sweet to extend a special discount just for our readers!! Use code “EMILYLEY” at checkout to save 40% off the Freshwater Pearl Cross Necklace and / or the Bracelet version!